We’re serious about renewable energy solutions that reduce consumption and costs. Through our strategic partnerships, we’ve enabled optimum management of the surge-and-dip nature of power grid supply in Africa and our Sirius supercapacitor storage devices are changing the solar energy landscape. Our best-of breed systems are available for residential and commercial applications through our consultative approach to system design. Our commitment to innovation has unlocked the key to unlimited storage capacity. With 1 million cycles and 100% DOD our Sirius supercapacitors could theoretically last for 2 000 years! By conducting energy audits, we are able to procure reliable data to analyse and profile energy patterns which underpin our tailor-made recommendations. The audits are designed to help you find out how much you can save by determining the current energy consumption and establishing the scope of energy solutions that will be most beneficial to you. We accurately size systems to the base-load of your facility or home to ensure that there is no “uneconomical” feedback into the grid or wasted excess energy. Our Canadian Solar PV Panels are robust and built to withstand extreme conditions. We have ready-to-install DIY systems to get you started and a range of packages on offer to suit your budget and lifestyle. Innovative Renewable Energy Solutions for all your residential & commercial needs! Individual consultation by industry experts. Tier 1 – A Grade bankable PV panels with 25-year performance warranty. Rapid charge translates into big savings on solar panels. Unsurpassed temperature tolerance from -25C to 85C. Fully trained and certified installation crews. Sustainable Energy Society of Southern Africa – an important body in the movement towards sustainability that connects like-minded professionals in the solar industry. South African Photovoltaic Industry Association – a non-profit organisation dedicated to promoting renewable energy in South Africa. The National Energy Regulator of South Africa (NERSA) is a regulatory authority established as a juristic person in terms of Section 3 of the National Energy Regulator Act, 2004 (Act No. 40 of 2004). Renewable energy solutions can be costly to install. That’s why GreenFin provides reliable financial options to people eager to change over to green energy immediately. 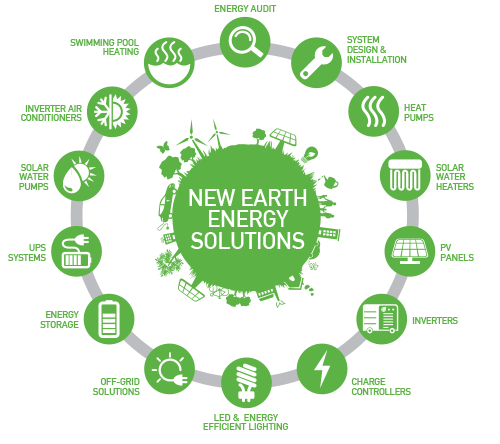 GreenFin only partners with installers and suppliers like New Earth Energy which use SABS-approved clean energy products.